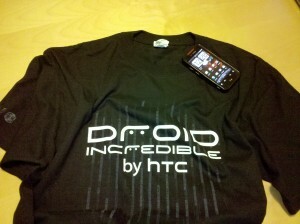 Over 200 entries for the Droid Incredible t-shirt! Nice work everyone! Thanks for all the re-tweets, spreading the word on Facebook and continuing to follow this goofy little site of ours. It’s pretty easy to continue to hand out prizes and put together contests with such a great community surrounding such wonderful devices. And again, thanks to everyone for participating, following us on Twitter and Facebook, and continuing to be awesome people.